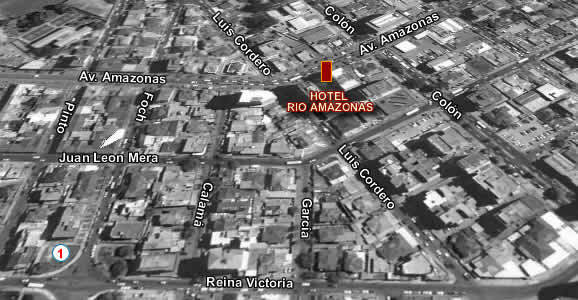 The Rio Amazonas Quito Hotel is located in one of the main tourist areas of the city, on Avenida Amazonas, La Mariscal. Near the Hotel you will find souvenir shops, travel agencies, art galleries, cafes, restaurants, museums and numerous bars and nightclubs. The Hotel is located only 15 minutes from Quito's Mariscal Sucre Airport and just minutes from downtown of the city. In the Amazon River Hotel can enjoy a comfortable accommodation for your holidays and for business travel. Located next to the Quito Historic Centre, with three thousand meters above the sea level. It has become the most important natural view of the city can be seen from the historic center. Located 15 kilometers north of Quito, the city tourist, cultural, scientific and commercial smallest Ecuador. Inside the famous Equatorial Monument, located exactly on latitude 0 ° 0'0 ". With an area of 3383 hectares and located 40 km northwest of Quito. Offers visitors spectacular scenery, 1200 plant species and diversity of birds, mammals and insects of multiple exotic appearance. If you like the height and want to have a spectacular view of the city of Quito, and even see snow like Cayambe, Cotopaxi, Chimborazo and can not lose the opportunity to board the cable car. It is located in San Antonio de Pichincha, 30 km from the Quito, thanks to its strategic position, was used as an observation point between the movements of warriors Cochasqui tolas and Quito.